The new Lord Advocate, Elish Angiolini, has been sworn into her new role at the Court of Session in Edinburgh. She is the first woman to be appointed as Scotland's top prosecutor and succeeds Lord Boyd, who announced he was resigning last week. 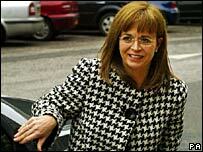 Ms Angiolini was nominated by the first minister on 5 October and MSPs approved the decision. The Queen later signed a warrant confirming the appointment. John Beckett QC was sworn in as the new solicitor general. Ms Angiolini will now become a senior member of Jack McConnell's cabinet. She has spent much of her career in the procurator fiscal service. In 2001, she became the first woman and the first non-advocate to hold the post of solicitor general.